Entry Level position responsible for the successful tire, battery, and oil installation to customer vehicles. Requires 1-2 years of automotive mechanical diagnosis, problem-solving and repair experience. Requires at least 2-3 years of strong automotive mechanical diagnosis, problem-solving and repair experience. 5 ASE Certifications required. Requires 5+ years of automotive mechanical diagnosis, problem-solving, and repair experience as you mentor and teach teammates while discussing problems with customers. 8 ASE Certifications required. Teamwork, integrity and positive energy. 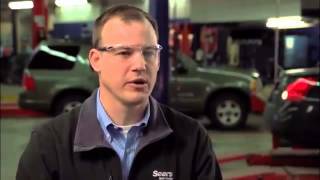 Technicians are the lifeblood of Sears Auto Centers. We can only provide our customers with the services that our technicians can perform. To maximize this potential, we have a team of dedicated technical trainers focused on giving our technicians the knowledge and skills needed to perform all of the services we offer; correctly and safely. Mentorships mixed with fun eLearning courses allow our technicians to learn as they work and our tiered technician levels offer incentive to continue learning. From oil changes and tires to electrical systems and diagnostic repairs, Sears Automotive technicians are some of the best trained in the industry.